I loved doing informal, friendly talks at local clubs… cycling, ham radio, computer, online folk, or whatever. Some of the best contacts emerged from casual settings like this, and in later years, when I became a “professional speaker,” I really missed the dinners, hanging out, and crashing at the homes of interesting hosts. Western Wheelers is a fun group, still very much active, and it hosts the annual Sequoia Century ride. This page shows announcements of the event in both the Flat Tyre (club newsletter) and California Bicyclist. 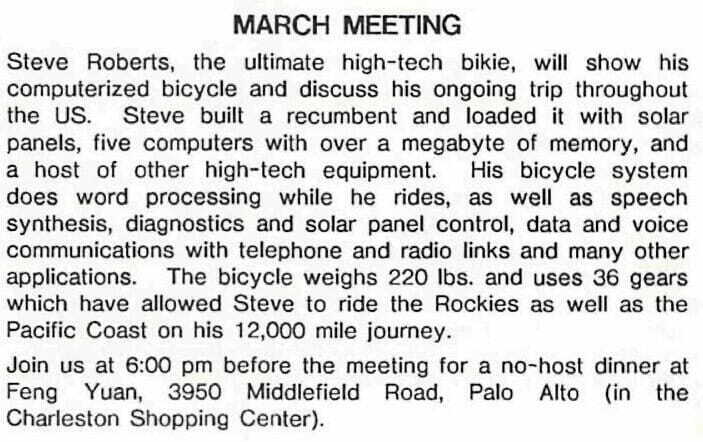 Steve Roberts, the ultimate high-tech bikie, will show his computerized bicycle and discuss his ongoing trip throughout the US. Steve built a recumbent and loaded it with solar panels, five computers with over a megabyte of memory, and a host of other high-tech equipment. 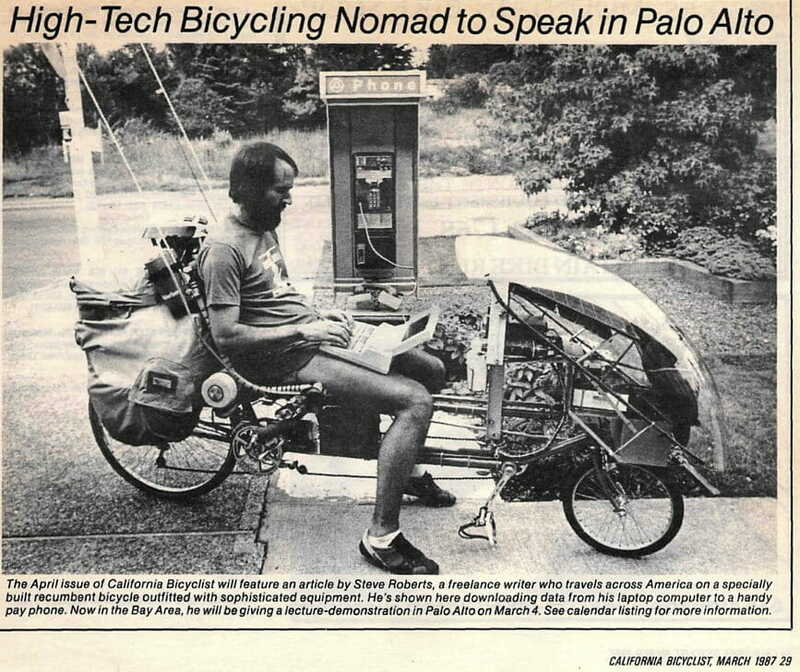 His bicycle system does word processing while he rides, as well as speech synthesis, diagnostics and solar panel control, data and voice communications with telephone and radio links and many other applications. The bicycle weighs 220 lbs. 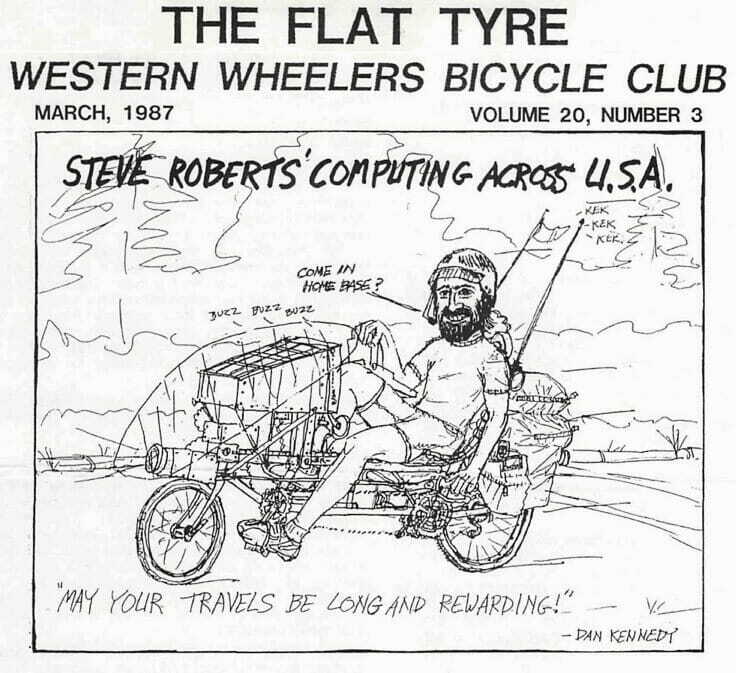 and uses 36 gears which have allowed Steve to ride the Rockies as well as the Pacific Coast on his 12,000 mile journey. Join us at 6:00 pm before the meeting for a no-host dinner at Feng Yuan, 3950 Middlefield Road, Palo Alto (in the Charleston Shopping Center).